We wanted to swing back around this morning for a stock that we mentioned on Monday of last week. We said we’d want to have it on watch in later sessions, as the company had just released news of a service agreement with pharma giant AstraZeneca. There was a slight pullback off of the initial spike that the announcement caused that day, and TROV found support at a low of .85. This morning the stock has reached as high as 1.35 in the premarket, which marks a rise of 59% over the lows we observed last week. We want to continue to keep an eye on TROV and see it make higher highs and higher lows. If the stock can hold at or above previous resistance at 1.20 on any pullbacks, it’ll be a positive signal. 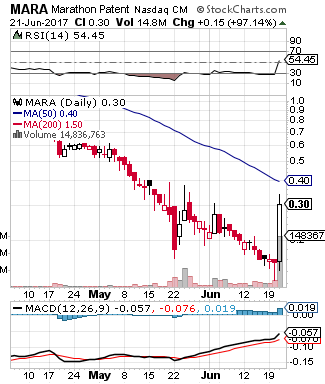 Hitting our radars as a bottom-bouncer this morning is MARA, which popped up yesterday with its first significantly bullish session in quite some time. It had been pretty well oversold for months, as you can see on the accompanying chart snapshot. We’ll be interested to see if MARA can put together a multi-day trend, or if yesterday’s move was an aberration. The first step will be a breach of the current 50DMA at .40, which also coincides with an an area of considerable previous resistance. 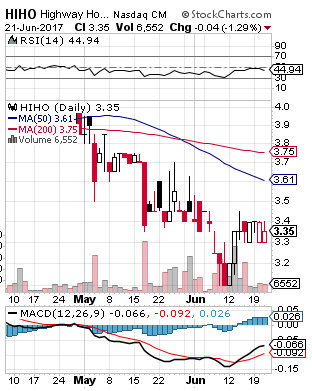 Highway Holdings Ltd. HIHO - Another potential bottom play we wanted to quickly point out this morning is HIHO. We’ve noticed that the stock has come up off of a double-bottom formation and has been holding support well at the 3.30 level over the past few sessions. We’ll look for it to continue to do so. Despite only providing a fleeting opportunity for gains on Tuesday morning after we submitted our options trading idea for the JNUG chain, we followed up with a reminder in yesterday’s report that the idea was still in play, and that we’d need to keep our heads on a swivel looking out for the move we were hoping for. With the help of a Fed rate hike of a quarter of a percentage point, announced by Chairperson Janet Yellen yesterday, our specified contracts, the JNUG 03/31 $7-8 Calls took a serious turn for the better. Once again, we’re going to reiterate our interest in these ideas, which could be in line to extend their highs, with JNUG gapping up in early trading this morning. We placed ARLZ on bottom watch yesterday morning in what turned out to be a fantastic stroke of good timing. We just wanted to update readers this morning on the reversal which did indeed occur during the session. While the intraday gain potential topped out at 25% as the stock ran from the open (and also low of day) at 2.11 to as much as 2.63. The inverted hammer candle that the stock posted yesterday is often thought to be an indicator of the end of a downward pattern, so we’ll be very interested to continue tracking ARLZ in sessions to come. Chart indicators are still looking very ripe, and we’d be surprised if the show was over after just a 25% rise. Lastly, we just want to address the cannabis sector, particularly those stocks that are connected to legal recreational marijuana. After some very damaging comments made recently by the Trump Administration wherein it was suggested that the government could crack down on legal weed, yesterday we witnessed something of a reversal from Jeff Sessions. Sessions appeared to hint at insufficient DOJ funding as a primary reason that perhaps the current regime will not be changing Obama-era guidance on leaving the treatment of recreational weed as a states’ rights issue. On the heels of this development, we’re going to want to keep closer tabs on the cannabis sector once again, particularly those plays that lost a lot of ground after the first round of comments from Washington. Some of our go-to favorites in the space have been OWCP, TRTC, SING, SGDH, CBIS, and MJNA, so we’ll be tracking these more closely in the days and weeks ahead, along with the sector as a whole, as stated above. The TSLA chart is looking ripe for a recovery, and the stock is gapping up moderately in premarket trading this morning. We want to signal a range of calls to monitor in the TSLA chain to potentially take advantage of what could be a protracted recovery. We’re going to zero in on the TSLA 04/07 $270-277.50 Calls, and monitor them in the days and weeks ahead.